Here is our bathroom sink that was created by my husband. 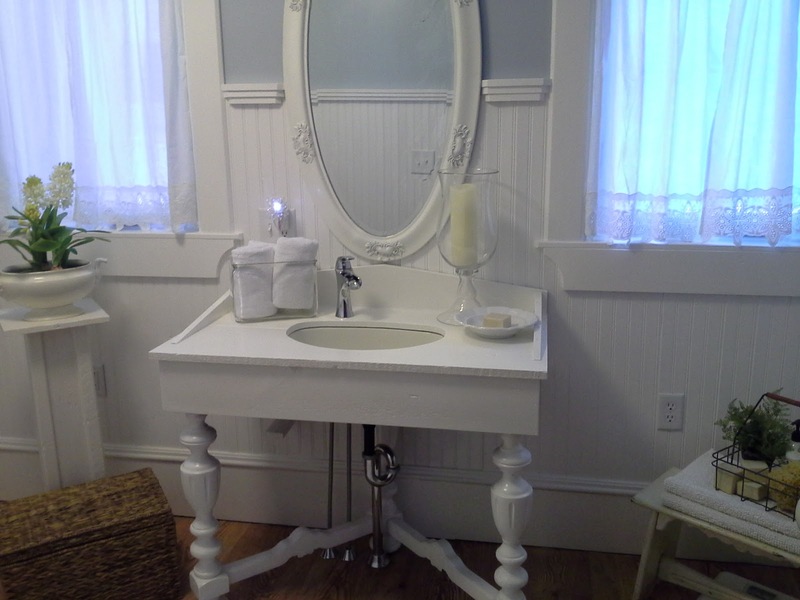 He made 2 of these sinks. He used a large old table and parted into 2 pieces. Clever ha? Here is a cheap find at an antique store. 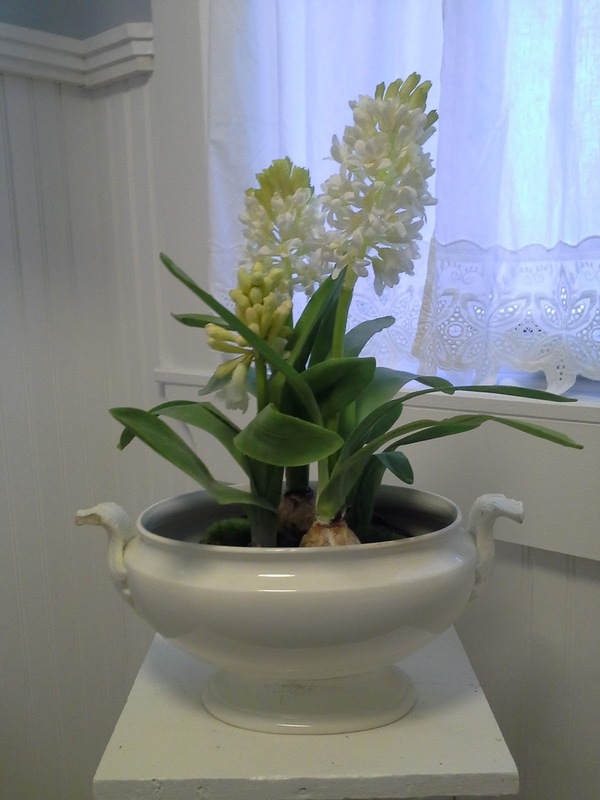 It is an old milk bottle carrier for 15 dollars. 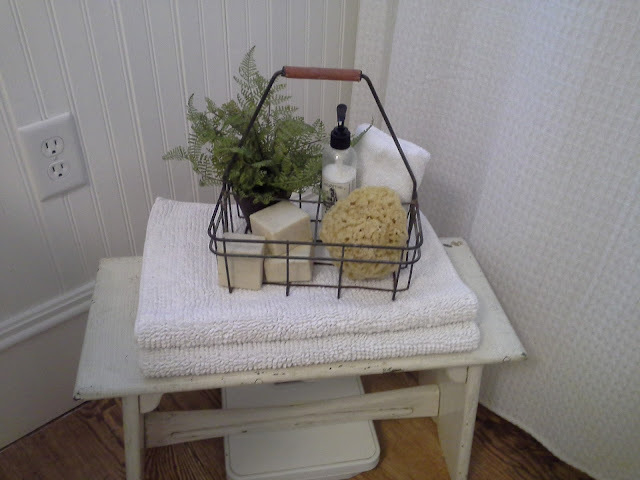 Great piece for some necessaries in the bathroom. Here is another view of bathroom. Old wooden cabinet piece found at antique store that I painted. 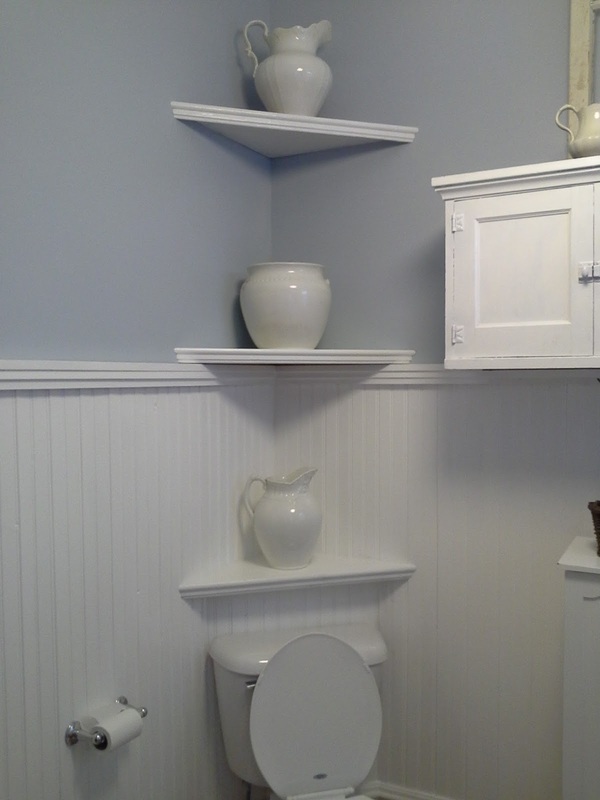 Had my hubby put shelving above toilet. Just found the white narrow cabinet sitting along side toilet on floor for 40 dollars at second hand store. When I have a bit more time I need to repaint due to some scuff marks on front. 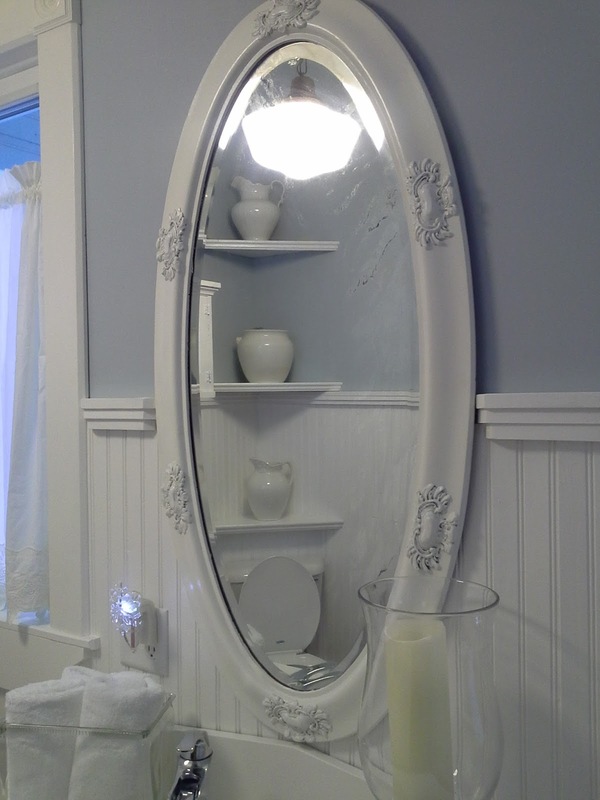 Just love that it makes a nice medicine cabinet and does not take up much space. 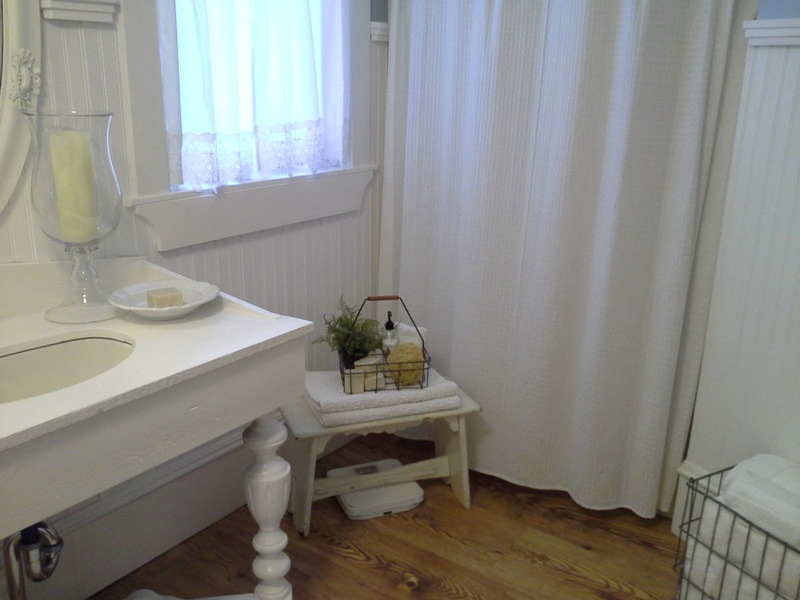 I am almost at a finished point in the bathroom. 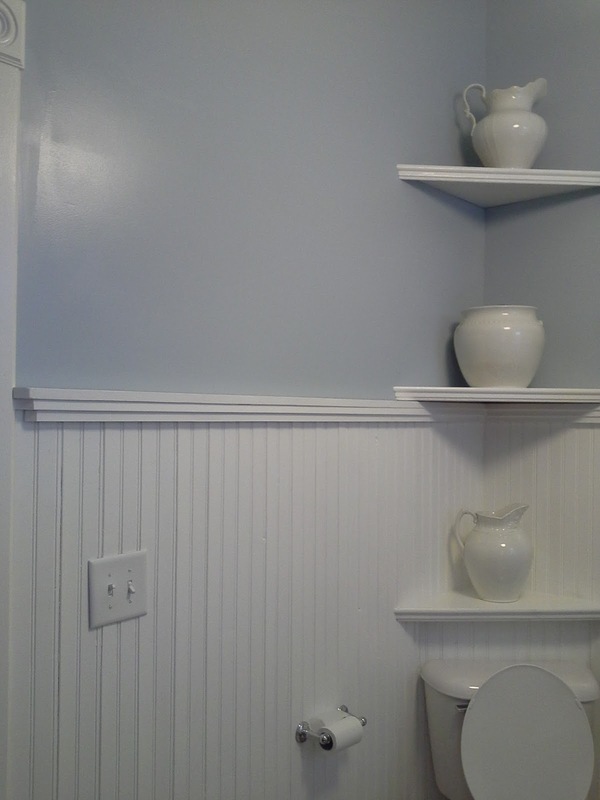 There is one wall that is bare. Just waiting for the right piece or picture to hang there. 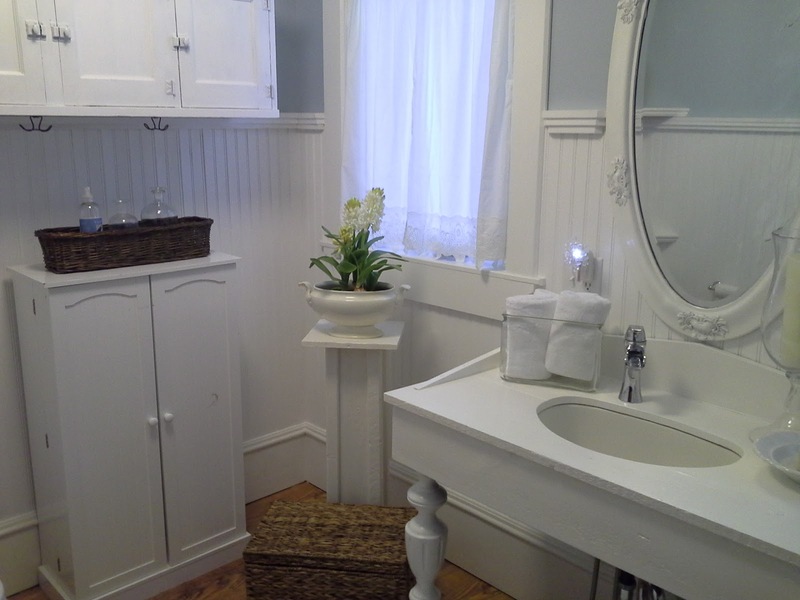 But thought that I would post what I had finished so far in the depot bathroom. Just love the blueish-gray paint with white. 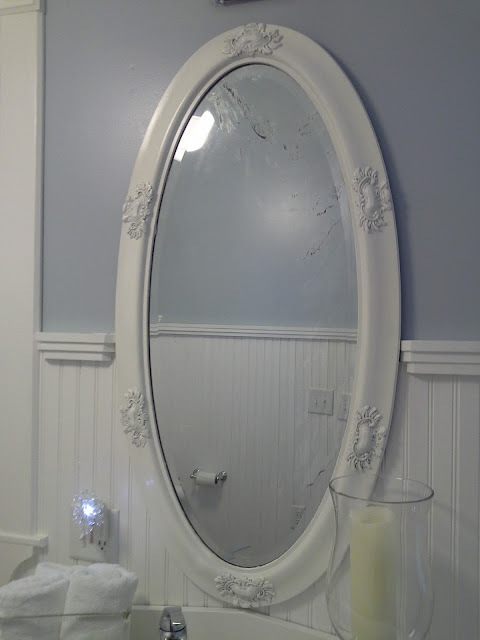 I repainted the oval mirror that is an oldie. It used to be gold. 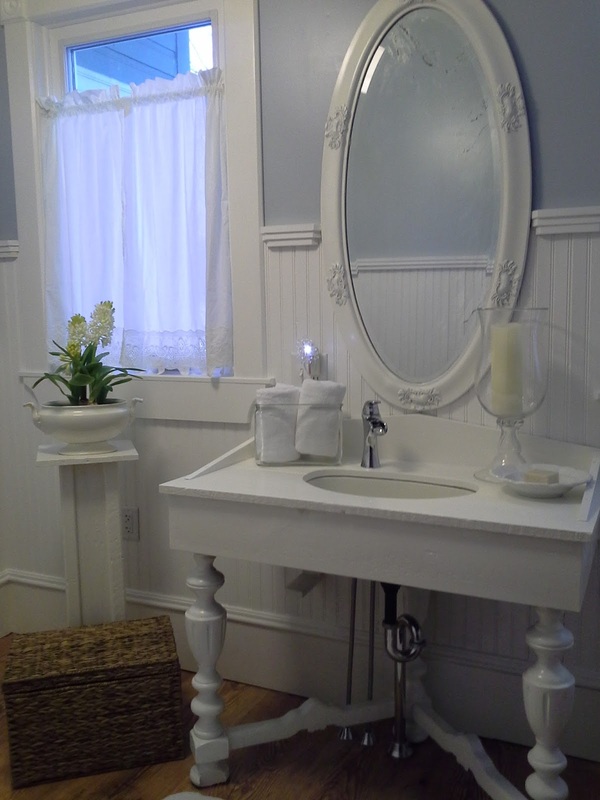 Just love what a little paint can do to refresh a project or turn it into something different. Hope everyone is having a great day. Happy Valentines day to all you lovers out there. The sink is made from a salvaged old table that my husband halved and made a sink into one half. 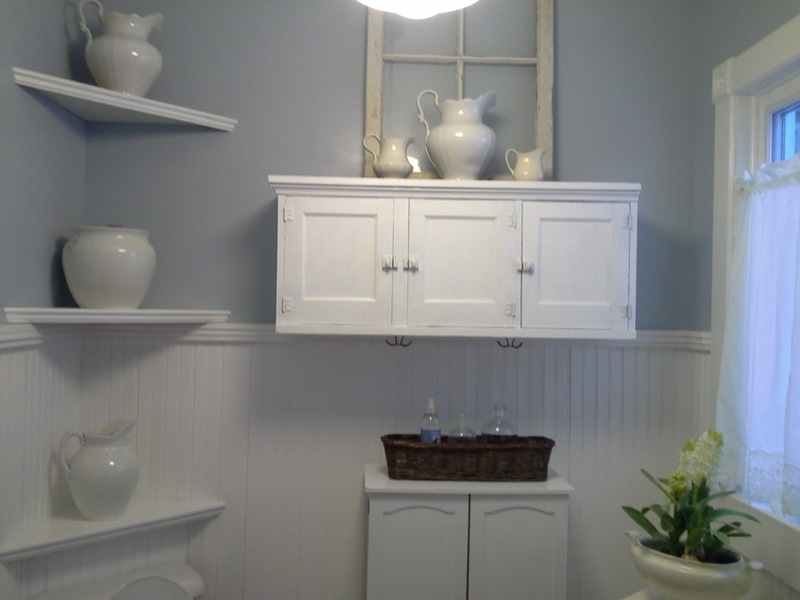 There is the other half of table sink in our store. 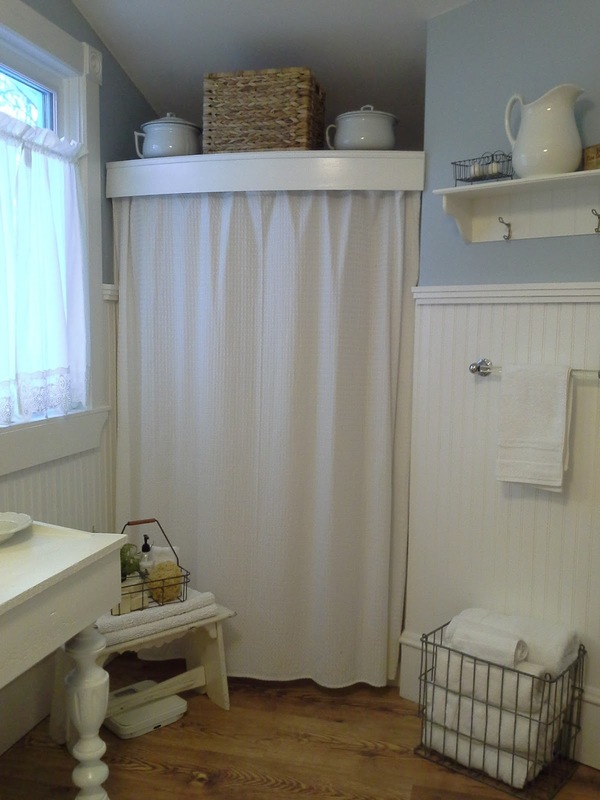 There is a picture of a vintage milk bottle carrier that works great as a place to house a few necessities for the bathroom. It was found in an antique store for 15 dollars. 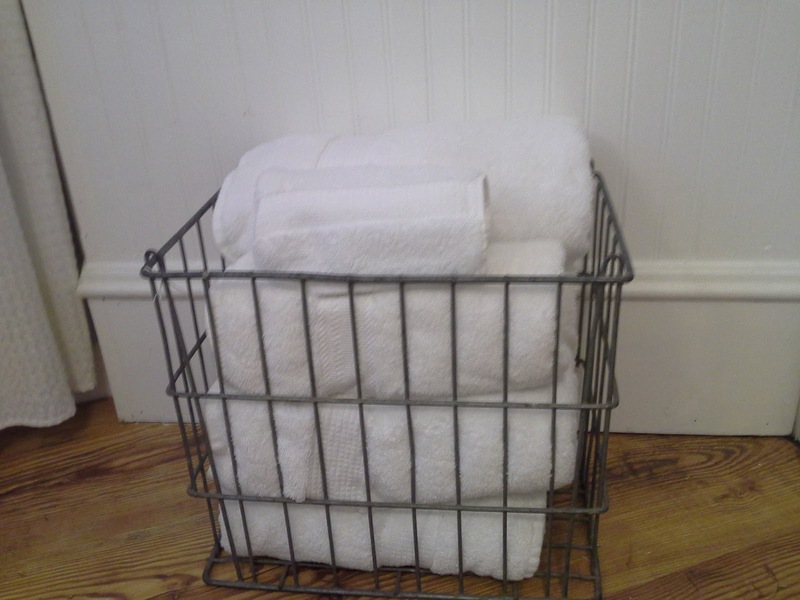 Also there is a thick wire basket that was found for 20 dollars at another shop. Works well for rolled up towels. Wow, you and hubby sure are creative. It looks lovely. 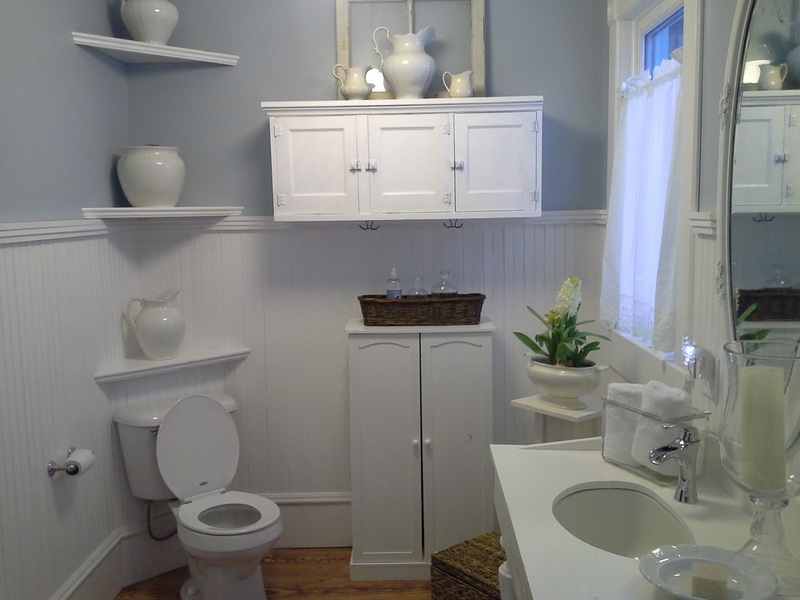 What is the color on the walls? Love it. Hi Theresa, I'm a Teresa too, no H. I saw your comment over at Cozy Little House with your link and came over for a look see. I love your style and have become your newest follower. Your bathroom is wonderful, the sink, mirror and all your little accessories look so pretty. Stop on over to my blog for a visit. On a side note, did you know that you have comment moderation enabled? It makes it very hard for people to leave a comment due to the characters one must enter to leave a comment, just a little heads up :) I tried and failed to enter the correct ones many times so hopefully I'll be successful so I can leave this comment. This is so clean looking... which is what you wanted it to be. Success! Lovely touches all the way around. 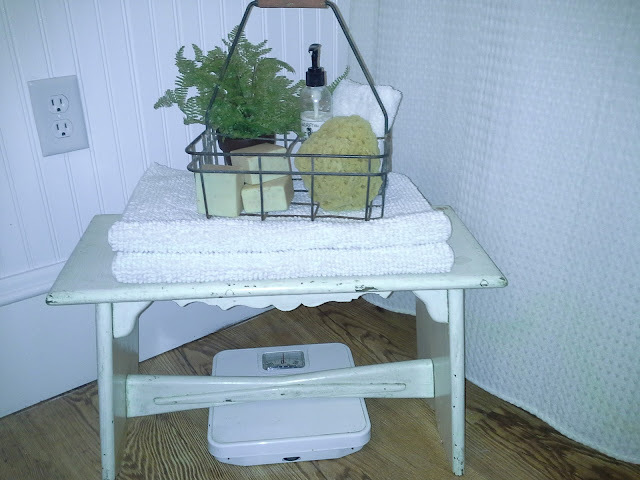 My husband and I did the same thing with a sink in our powder room. Sometimes it takes a bit of ingenuity to figure out would work in a certain spot. I will have to blog about that sometime! Thanks for sharing!